This is a guest post by Mark Germaine. Mark is currently completing his MSc in Sport Nutrition at Liverpool John Moores University, where he is also working as a Performance Nutritionist with various weight-making athletes. He has an undergraduate degree in Sport Science and Health, and has presented his thesis at the Faculty of Sport & Exercise Medicine Conference. Before we get into this article, I’d just like to say that when myself and Danny agreed upon a topic, Impey et al. (2018) had not yet been published. This paper essentially encapsulates the body of research with regard to carbohydrate periodization and I would direct readers to this paper if they would like to read further into the science of this area. I will therefore do my best to keep the article novel and set the scene for why this may be important, particularly in competitive sports, translate this science into the practical application, and what sports can potentially benefit from utilizing such strategies. 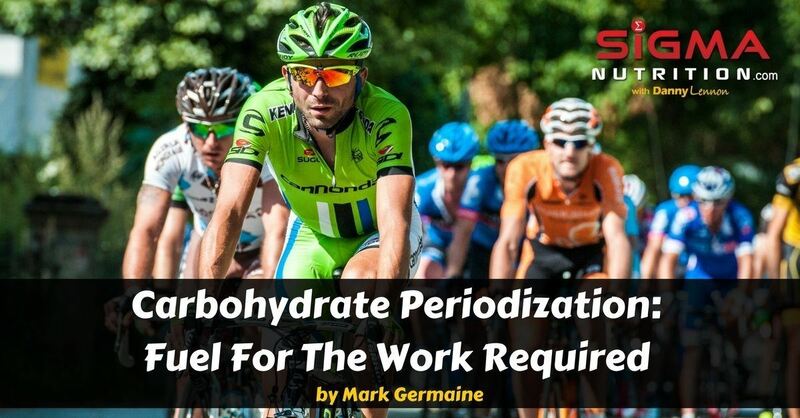 Let’s start by first clarifying what carbohydrate periodization is, and what it is not. Over the past number of years Team Sky have been by far the most successful professional cycling team on the UCI World Tour, with 5 Tour de France winners out of the last 6 years. Four of those famous wins came from super athlete Chris Froome. I quite often see Team Sky, and in particular Chris Froome, paraded by some low-carbohydrate advocates as their poster boy for what can be achieved on a low carbohydrate diet (see here for a typical example). But here’s the problem: the idea that Team Sky utilize a consistently low-carbohydrate diet with their riders is simply not true. Both Froome and Team Sky’s Head of Nutrition Dr. James Morton (who I know from LJMU) have confirmed this. Team Sky (or Chris Froome personally) do not undertake a chronically low carbohydrate diet during training, and certainly not during competition. They do, however, periodize their carbohydrate intake. You may have heard of athletes using a “Train Low, Compete High” approach. However, in a literal sense, this term doesn’t accurately capture carbohydrate periodization as people may assume it means all training is done in a low-carbohydrate state, followed by loading up on carbohydrate prior to competition. That’s not carbohydrate periodization. And on the other end, it is not undertaking all training sessions with high-carbohydrate availability either. Rather, carbohydrate periodization is the manipulation of carbohydrate availability on a day-to-day or even a meal-to-meal basis. Whereby you consume low-, moderate- or high-carbohydrate in given meals, to alter carbohydrate availability (or glycogen content) for a proceeding training session. Note that I’ll likely use ‘carbohydrate’ and ‘glycogen’ interchangeably throughout this article for the sake of simplicity. Okay, so we have a meal-by-meal periodization of nutrition. But why the hell does it matter? If you want to run as fast as you can, over anywhere from 800m to 42km (a marathon), you’re quite simply going to need carbohydrate to fuel this activity. Why? Well it’s simply biochemistry. The rate of ATP synthesis from lipid metabolism (~1mM/kg/s) is simply too slow to supply the ATP needs of the contracting muscle during these events, particularly at the pace that the elite athletes compete at. And while the phosphocreatine system can supply the rate of ATP synthesis, it has a limited supply, and as such carbohydrate is the predominant fuel source over these distances in running. We can actually measure the energy contribution to sub-maximal (less than 100% VO2max) exercise. 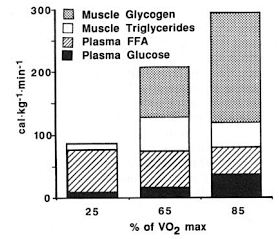 And what we typically observe is that once athletes begin to exercise at an intensity representing ~85%+ VO2max, the energy is almost exclusively being generated through carbohydrate metabolism, demonstrated by RER values reaching close to 1 and above. Romjin et al., (1993) demonstrated this increase in carbohydrate reliance as exercise intensity increased some time ago now in a classical study on this subject. They also demonstrated that as exercise increased in duration, there was a decrease in carbohydrate use and an increase in the reliance on free fatty acids (FFA). However, this study was conducted in an overnight fasted state, with no carbohydrate fed before or during exercise, which would favour conditions of FFA use over carbohydrate. Luc Van Loon’s group supported these findings some years later, supporting the role of carbohydrate use in high intensity exercise. As that there is not only a reduction in the percentage of fat used at these intensities, but there is also a reduction in absolute fat use. Why is this? It is thought that entry of long chain fatty acids (LCFA) into the mitochondria may limit FFA oxidation during intense exercise. LCFAs need a carnitine-mediated transporter to cross the membrane to be oxidized. However, during intense exercise, as we get an increase in CHO use, we get increased glycolytic flux, and as a result produce more Acetyl-CoA. 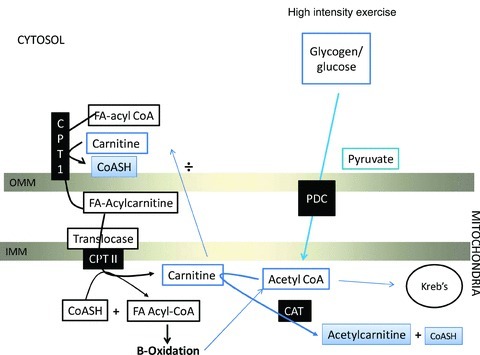 In order to cope with the increase in Acetyl-CoA, carnitine is sometimes used as a buffer, so we can continue to produce energy to sustain the exercise. If there is a decrease in free carnitine, this may then inhibit the amount of LCFA being transported into the mitochondria. And thus, we begin to see how during high intensity activity, we will need carbohydrate if we want to perform to our best, despite what some other scientists will have you believe. So, if we are reliant on carbohydrate for high end performance, why all the fuss about training with low carbohydrate? Early studies investigating the use of training with low glycogen training, or high fat diets, were trying to increase FFA oxidation during exercise and spare muscle glycogen in an attempt to delay the onset of fatigue. However, while this leads to an increase in the ability to oxidise FFA during exercise, it comes with a cost: a decreased ability to oxidise CHO. In as little as 3 days of a low-carbohydrate, low-fat (LCHF) diet, we see an increase in an enzyme called PDK. PDK is a kinase enzyme, and kinases tend to phosphorylate other enzymes. Essentially, this can either “switch on” or “switch off” other enzymes. In this case, PDK phosphorylates pyruvate dehydrogenase (PDH), which switches it to its inactive state, or reduces its activity at least. However, what happens if we periodically restrict carbohydrate around the training sessions themselves? We can view this as a landmark study that really kick-started further research into commencing certain sessions with low carbohydrate (glycogen) availability. So, how did the group who periodized carbohydrate availability see improved performance and markers of performance? I’ll try describe this in a relatively simplified manner, but for those looking for more specifics and in-depth literature I’ll direct your attention here, here and here. Training with low glycogen availability seems to enhance molecular signalling pathways associated with favourable adaptations to endurance type exercise. I’m sure a lot of readers would be familiar with the signalling pathways for building muscle, in that we ultimately want to increase muscle protein synthesis and some key proteins involved in this process such as mTor and p70s6k. angiogenesis (supplying the muscle with a greater blood supply). The diagram below (taken from Impey et al., 2018) illustrates this process. Essentially, when we exercise with low glycogen availability, we get upregulation of key signalling protein kinases AMPK and p38MAPK. These signalling protein kinases, alongside higher FFA availability, subsequently activate and translocate transcriptional factors (p53, PPARδ) and co-activators (PGC-1α) to the nucleus and mitochondria, such that they upregulate the expression of genes related to mitochondrial biogenesis, lipid oxidation and angiogenesis. So I guess if you wanted to draw a comparison to protein synthesis, you might liken AMPK to mTor, and PGC-1α to p70s6k. So, we can’t train with chronic low carbohydrate availability as it impairs carbohydrate metabolism and thus exercise performance. But restricting carbohydrate around some sessions enhances the molecular signalling response suggesting a benefit for endurance training. So what should we do? We periodize some training sessions to be undertaken with low carbohydrate availability. How do we go about implementing this? One method is using a twice-a-day model, whereby you train earlier in the day, restrict carbohydrate in the post-exercise window, and commence a later session with low carbohydrate availability (no pre-exercise meal of carbohydrates, in addition to some degree of glycogen depletion from the earlier session). Of the 7 studies using this method, all 7 resulted in greater molecular activity favouring the low-carbohydrate condition. However, only 2 out of the 5 looking at performance demonstrated an increase in performance. Many athletes do, however, perform more than one training session per day, so this may be a feasible approach if the time between sessions is not so large that they are practically going the entire day without carbohydrate, and thus mitigating the practical element. Fasted training is another method used, and it is something which has been used within certain sports for a long time already. Kenyan distance runners, for example, are known to wake up and go for a fasted morning run, and boxers are long known for going for fasted runs in the morning. While this is undoutedly a cultural thing is these sports, could there be something to it? The findings in this area are a little more equivocal. In 2 of the 5 studies on this, whilst the training was commenced fasted, the participants had a muscle glycogen level of 500 mmol/kg dry weight, which indicates to me that it is likely they had a high-carbohydrate intake the day before (to speculate, perhaps somewhere around 6-8 g/kg). Of the 2 studies which measured performance, there was no greater improvement despite markers of increased citrate synthase activity and -HAD. So while the jury is somewhat out, fasted training is a tool that is easy for athletes to implement and so is an option in cases where there is no risk of detrimental impact. Building on the concept of fasted training, some studies have implemented a “sleep low, train low” approach, whereby you not only perform fasted training, but also restrict carbohydrate the evening prior, often after an evening exercise session. This will likely incur a greater degree of glycogen depletion, and we can see this with typical glycogen levels between 100-300 mmol/kg dry weight within these studies. In addition to this, the longer after the last carbohydrate feeding, we typically see a gradual decrease in total carbohydrate oxidation and a linear increase in the appearance of glycerol (signifying increased FFA release into the blood from lipolysis). So, it may or may not come as a surprise that this approach typically results in a greater expression of p53, PGC-1α and p38MAPK to name a few, in addition to fatty acid transporters FABP and CD36. And perhaps more importantly, both studies which measured performance resulted in a greater benefit for the low-glycogen group, perhaps suggesting that the glycogen content in the previously mentioned “fasted training” studies were too high to reap the benefits. Another strategy worth of note is “recover low”, whereby you simply restrict carbohydrate in the post-exercise period. Research on this method has demonstrated enhanced signalling pathways for mitochondrial biogenesis. It’s likely that restricting pre-, during and post-exercise may enhance some of the protein kinases further. However, there is a balance which must be met between improving endurance training, maintaining an efficient carbohydrate metabolism pathway, and also maintenance of muscle protein synthesis. Note – All the discussed studies above can be found in this text, and are discussed in much greater detail. Despite the potential benefits for adaptation and long-term performance for training with low glycogen availability, there are however some potential downsides which must be taken into consideration. There are also some important questions to debate. For example, is it the low-carbohydrate/glycogen availability per se, or is it low energy availability? Or is it likely a combination of both? Hammond et al. (2016) tried to shed some light on this, by feeding a high-fat diet to match the calories lost from carbohydrate restriction. What they found was that both the high-fat and high-carbohydrate groups had similar gene expression. In that Hammond paper, the high-fat diet suppressed post-exercise p70s6k, suggesting a high-fat diet may impair the muscle protein synthesis response to exercise. This effect on MPS is important to take into consideration, and we see that p70sk6 is also suppressed during low CHO availability, even when the provision of a leucine-enriched protein is fed. Work capacity during exercise is something else which must be taken into consideration. The exercise capacity when in a low-carbohydrate state is diminished, which could potentially compromise high intensity planned training sessions. If you are not able to complete the planned training sessions, this could potentially hamper the long term training and competition goals. Impey et al. (2016) actually demonstrated a work efficient use of carbohydrate, in that a high carbohydrate group performed significantly greater work than the low carbohydrate, however, both groups exhibited a similar response to the training, despite the difference in workload. This lends into the periodization model, whereby we can undertake planned low load sessions with lower carbohydrate availability, while ensuring that planned high intensity sessions are undertaken with high carbohydrate availability. There was actually some work presented at the International Sport & Exercise Nutrition Conference (ISENC) in December reinforcing this message, which may be published in the coming year or two. In addition to the reduced work capacity, potential reduction in muscle protein synthesis and increase in PDK4, we must also consider the effects on the immune system. High intensity training can have immunosuppressive effects, which may be exacerbated in periods of low carbohydrate availability, however, further research is required to fully elucidate this. Another thing to note is, that while not all training studies have shown a long term performance benefit, none have shown a decrement in performance. So, at worst, you’re complicating the diet. How Do We Apply This As Practitioners? Hopefully by now I have explained the why and the how of carbohydrate periodization. Now I’ll briefly finish off by giving some practical examples of how this could be implemented in certain sports. Due to the amount of the research being centered around it, cycling is the obvious choice to look at first. Athletes are loaded with carbohydrate prior to, and during, high intensity sessions. While for recovery sessions, they will eat low-carb pre-session and consume nothing on the ride. Then in the evening of one of these recovery days, they will begin consuming carbohydrate again in preparation for another intense session coming the following day. This is where the art of performance nutrition comes into play, as there are (currently) no set guidelines for what represented high, moderate or low, and this will likely change with regard to the individual and the type of training undertaken. Running is another sport where this could prove advantageous. As I mentioned earlier, many runners now undertaken a morning run (not very intense, light pace) and will typically perform intervals on some evenings. Usually there is at least 1 long run per week. The training schedule may lend itself to incorporating some “sleep low, train low” sessions, where you could have athletes recover low from the high-intensity sessions by not consuming carbohydrate in the evening and then “train low” by performing a fasted run the following morning. Combat sports are another potential benefactor of carbohydrate periodization. Carbohydrate restriction is typically associated with energy restriction, which combat sport athletes will be undertaking during a fight camp in order to make weight. Due to the schedule of fighters training, there will likely be scope to implement some carbohydrate-restricted sessions, which may also be an easy way to manipulate the energy intake of the athlete. Even team sports may benefit from such an approach. Different training days for different team sports typically have differing demands. In this sense, you may periodize the carbohydrate on a day-by-day basis as opposed to meal-by-meal with the above examples. Recovery days and technical days may be undertaken with low and moderate carbohydrate intakes, while intense training days, pre-match, match day and the day after a match may all be high carbohydrate days. Consuming protein prior to exercise will not negatively affect the response to training low, and as such it may be smart to have athletes consume 20-30g high quality protein before undertaking these sessions. Caffeine is another consideration. With the lack of glycogen impacting the intensity the athlete can train at, caffeine may be an ergogenic aid which could lift selected training sessions. In line with this, carbohydrate mouth rinsing is another ergogenic aid which can be useful when the athletes are in a glycogen depleted state. Hopefully readers understand a little bit more about carbohydrate periodization and fueling the work required now and may be able to implement its use in practice. The concept of altering substrate availability on a day-by-day, meal-by-meal basis, to promote endurance training adaptations. Mark has graduated with a first class honours degree in Sport Science and Health, and has presented his thesis at the Faculty of Sport & Exercise Medicine Conference. He is currently completing his MSc in Sport Nutrition at Liverpool John Moores University, where he is also working as a Performance Nutritionist with various weight-making athletes ranging from combat sports, jockeys, powerlifters and formula e-racing. You can follow/contact Mark on Facebook, on Twitter @MarkGermaine (typically more academic) or on Instagram @mgermaine91. ARTICLE: Eat More Fat, Burn More Fat: Myth, Magic or Metabolic Advantage?